Why can’t the post-apocalyptic world have anything nice? It’s always full of weirdos, biker gangs and cannibals… or at least that’s what every post-apocalyptic movie we’ve ever seen has taught us. Isn’t there some kind of future where the toxic waste hasn’t transformed half the population into blood-thirsty mutants? Isn’t there some version of humanity’s future that leads to rainbows, sunshine and everyone singing a spirited rendition of Kumbaya in a peaceful circle? Bah, who are we kidding? That kind of future would make for one snooze-fest of a movie! If the world is going to head to hell in a hand basket, you may as well look like a tough as nails kind of hero who eats deadly wasteland mutants for breakfast! 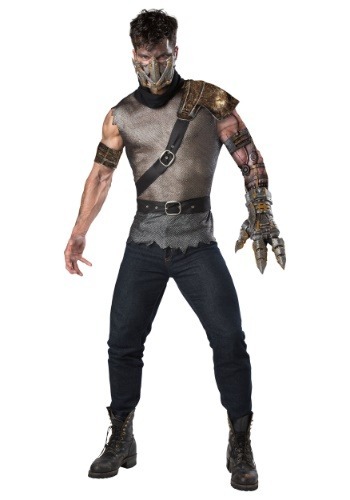 That’s why if you plan on roleplaying as an apocalypse commando, you should be wearing this Wasteland Warrior costume. This men’s costume takes its inspiration from the many dystopian movie depictions of tough anti-hero types. It comes with a shirt that looks battle weathered, along with a belt. (You can never have enough belts when you’re wandering through the barren lands.) Of course, it also comes with glove that makes your arm look like a big old metal claw, because nothing says I survived nuclear fallout quite like a metal claw for a hand. Once you’ve gotten yourself all geared up in this rugged costume, you may just feel like doing battle with some bandits to assert your supremacy. After all, it’s survival of the fittest out there!